New rolling mill pattern plates! Available in numerous patterns and designs. Size: 2” x 3” x 1/8” The plates are curved, and that’s okay! 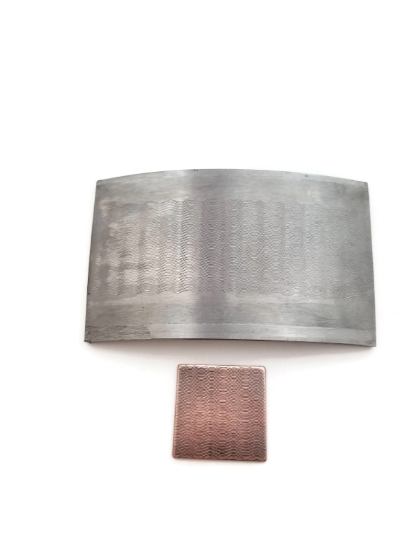 NOTE: It is possible to use these rolling mill plates with a hydraulic press, but the results won’t be the same as with the rolling mill; we only recommend a rolling mill. See the attached PDF for more information. Designed to be used in a rolling mill with annealed, non-ferrous metal. Copper sample in photo is 1" square to give you an idea of the scale of the design. The plates are curved, and that’s okay! 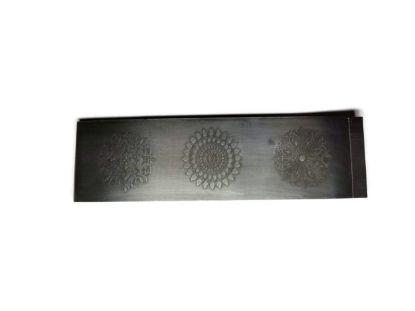 NOTE: It is possible to use these rolling mill plates with a hydraulic press, but the results won’t be the same as with the rolling mill; we only recommend a rolling mill. See the attached PDF for more information.